As most Australians woke up for work and school on Monday morning, Townsville was being inundated by its worst flood on record. Townsville Airport received 181mm of rain during the 24 hours to 7am on Monday, bringing their total over the last seven days to 1,052mm. This is the first time on record Townsville has seen one metre of rain in a week. To the west of Townsville, Upper Bluewater's 157mm during the last 24 hours brought their total over the last eight days to a massive 2,068mm. Image: The sun rises over masses of cloud above northern Queensland on Monday morning, being produced by a tropical low and monsoon trough. In response to the last week's unprecedented rainfall, Townsville's Ross River Dam was sitting at 242 percent of its capacity at 4am on Monday, up from 65 percent a week ago. This is more than 80 percentage points above any other flood event during the last decade. The Ross River Dam's spillway gates were automatically opened to their full setting during Sunday night to release some of this water. At full flow, the spillway allows about eight olympic swimming pools of water to flow through its gates every 10 seconds, on its way to Townsville. The Ross River at Aplin Weir in Townsville had reached 3.16 metres by 4am on Monday morning and could reach four metres during Monday. According to the Bureau of Meteorology, conditions will change rapidly on Monday and parts of Townsville are likely to experience unprecedented flooding. 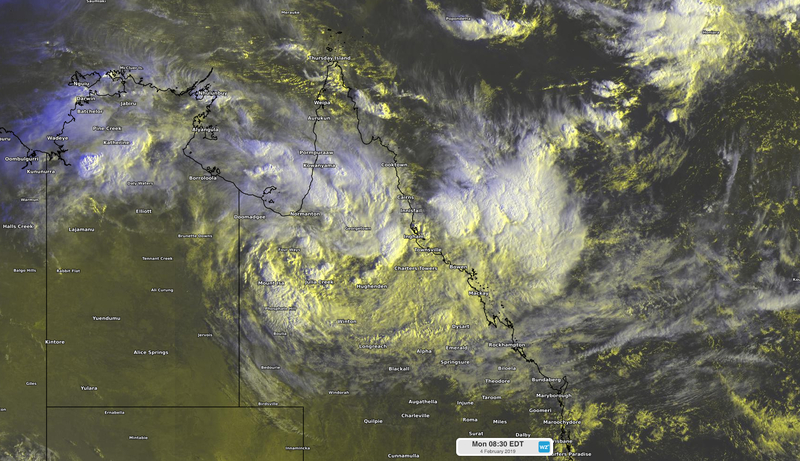 The last week's heavy rain has been caused by a near-stationary tropical low and monsoon trough sitting over northern Queensland. These system are likely to maintain rain and storms over a broad area of the state's tropics during the coming days. The focus of the heaviest rain is likely to shift south from Townsville towards the Central Coast and Whitsundays District. Areas between about Bowen and Mackay could see daily rainfall totals of 100-200mm during the first half of this week. Looking ahead, it's difficult to tell where the tropical low and monsoon trough will move during the second half of the week. Some forecast models indicate the low could move into the Coral Sea and other suggest a track up over the Gulf of Carpentaria. Either of these scenarios would increase the risk of a tropical cyclone developing. Keep up to date with the latest weather and flood warnings at http://www.bom.gov.au/australia/warnings and visit http://www.bom.gov.au/cyclone for updated tropical cyclone information.